There are a few rules and caveats to this game that will take some effort to understand. Please take the time to READ THIS POST CAREFULLY before playing. Any questions, hit the discussion thread. There are 400 numbered Christmas Presents sitting in a room and your fellow troopers are hiding in them. Find them! 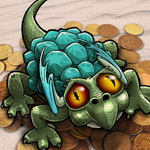 There are two objectives to this game and each comes with a $5 cash prize, as well as 30 dragon scales! #1: Be the last person still hiding at the end of the game. #2: Find the most hiding spots of other people during the course of this game. It is possible for there to be a tie in either objective which would result in splitting of the prize money. Either way, $10 & 60 dragon scales will be given away! The number represents your guess for that round. If your guess uncovers another Trooper or more (yes there may be more then one hiding in the same Christmas Present) you will get a point and that person will be eliminated from the game. It is up to you to keep track of which numbers have already been guessed. Seeking a number that has already been named will only result in you wasting your turn for that round. If your post has been edited, your guess will not count. BAH HUMBUG SLUG : You open the present and find a Jack in the Box! You wind it slowly with anticipation. Suddenly, the music stops and a boxing glove springs out punching you in the face. You are knocked out and will be unable to participate during the next round! GLITTER BOMB : You open a present and an explosion of glitter erupts, covering you from head to toe. As you run back to your hiding spot, you leave a trail of glitter making it easier for others to find where you are hiding. Everybody is told which 100 presents you are hiding in: (example: Treasure is hiding somewhere in presents 100-199!). Get hit with another Glitter Bomb, and your position will be further triangulated. GRINCH BOMB : When this is activated, money will fall from the sky and you will have a choice to make. If you are the first one to post GRINCH! you will get the money. Anybody who posts GRINCH! (even if you aren't the first) is leaving their hiding place to make a grab for the money. In the process, your hiding place is revealed and you are eliminated! If somebody correctly opens the present where you are hiding, you will be eliminated! If you post anything other than a variation of what is detailed above, you will be eliminated! If you attempt to guess more than once in a round without the appropriate power-up, you will be eliminated! If you attempt to use a power-up you did not earn, you will be eliminated! If you look at me funny, you will be.... well just don't look at me funny. Good luck everybody! Disclaimer: If you do not actively participate in at least 7 rounds by the time only one active participant is left, or you do not participate in at least 1 of the 3 rounds prior to there being only one active participant left, you will evacuate your present and be disqualified for inactivity and ineligible to win. Active participation will only be counted toward valid posts that follow the rules. Posts that include a number that has already been picked previously do not count towards active participation unless I state numbers should be reconsidered. If you have any questions or comments about this contest, you can post them here. Congratulations to Ironman_101 for being the last member still hiding in their chest! $5 & 30 Dragon Scales will be added to your account! Congratulations to Ironman_101 and Shelilah for finding the most hidden members! You each found 7 members each and will be splitting the prize! $2.50 & 15 Dragon Scales will be added to each of your accounts! Jonathan21 - Found by Span! Tiffy - Found by Mosdata! Metsrock69 - Found by Krishnag! Lilmonkey1959 - Found by Janniec! LoveHearts1 - Found by Icefyre! GLMoney - Found by Christine90! Kavi - Found by Adman29189! Hedwig - Found by Shelilah! 1 Jxin31415 - Found by Jxin31415! 1 Krishnag - Found by Shelilah! Eve129 - Found by Jasonxaio! Tgreene66 - Found by Janniec! Elfick - Found by Christine90! Winning - Found by Jasonxiao! Bluebell - Found by Attackdog! Remorsed - Found by Shelilah! 1 Icefyre - Found by Shelilah! 2 Jasonxiao - Found by Drag29! Angela18 - Found by Shelilah! 2 Christine90 - Found by Ironman_101! 1 Adman1989 - Found by Attackdog! Angelwaters101 - Found by Nickgoel91! 2 Attackdog - Found by Shelilah! 1 Drag29 - Found by Span! Kace707 - Found by Shelilah! 2 Span - Found by Nickgoel91! 7 Shelilah - Found by Ironman_101! Cashmee - Found by Ironman_101! Ivyleaf - Found by Nickgoel91! Goldcoin - Found by Ironman_101! OLBux - Found by Ironman_101! 3 Nickgoel91 - Found by Ironman_101! 2 Janniec - Found by Ironman_101! 1 Mosdata - Mosdata got ahead of themself and prematurely popped out of their present! Blackrose - Blackrose got ahead of themself and prematurely popped out of their present! Treasure Seek : Christmas Edition Begins NOW! Good Luck Troopers!